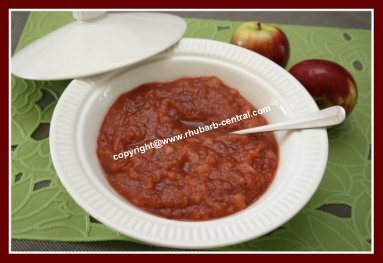 This quick and easy to make Apple Rhubarb Sauce, is a great idea for a side dish to accompany ANY supper. Fish, Beef, Pork, Chicken, or any other dinner will be enhanced by this rhubarb-applesauce recipe as a side dish. I also use this sauce with any other supper including "quick" meals like macaroni, spaghetti, soup, stew, casseroles and more. Fresh and Delicious! 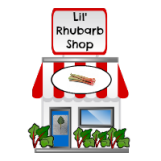 Remember, rhubarb is vegetable, so, combined with the apples, you have an additional fruit and an additional vegetable added to you menu! You can also make plain stewed rhubarb sauce as a side dish to any meal. In a pan, place the chopped rhubarb and the chopped apples with the water. On medium-high heat, uncovered, bring the mixture to a boil. Immediately reduce heat to low, and allow the mixture to simmer for about 20 minutes, with the lid on part way. Stir occasionally. When the rhubarb and apples are tender, remove the pan from the heat, and add the sugar. Using potato masher, mash the apples with the rhubarb. If desired, sprinkle the rhubarb applesauce with a cinnamon and sugar mixture. 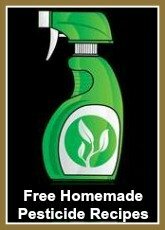 (Or have the sugar and cinnamon mixture on the table for those who wish to add it to their serving). Simply D E L I C I O U S! If you do not grow rhubarb, why not consider it? 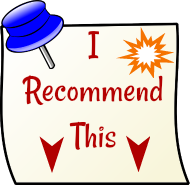 It really "grows like a weed", and it is a thrifty, nutritious addition to meals from the simplest to the most extravagant menus! Do you want to make your greenish rhubarb into crimson red rhubarb? ... Check out the link below!